Editor’s note: The following post is one in a two-part series on public/private health care delivery with the BoP in Africa. If you are a pregnant woman in the Upper East region of Ghana who has registered with MOTECH, you will receive this message during the fifth week of your pregnancy. 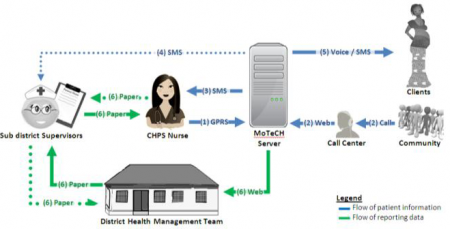 Started in 2009, MOTECH is an mobile health platform created in partnership between the Ghana Health Service, Grameen Foundation, and Columbia Mailman Public Health School, with funding from the Bill and Melinda Gates Foundation. It is designed to facilitate better medical information dissemination to rural areas and improve operational efficiency at community- and district-level health centers in one of the poorest regions of the country. MOTECH offers two main applications: mobile midwives and the nurse application. 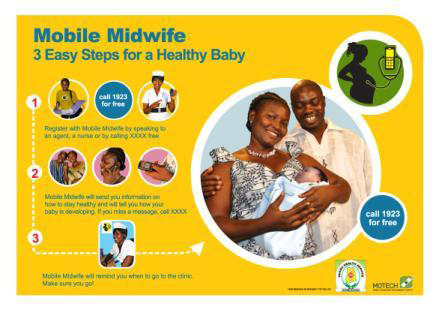 For mobile midwives, pregnant women and their families register for the service through the CHPS centers. They receive weekly time-specific messages about their pregnancy, including alerts and reminders regarding visits to the local CHPS center, actionable information and advice about best practices, and educational info to ensure a healthy pregnancy. MOTECH customers have the option of receiving messages via SMS or voice. Due to the low literacy rate in the region, 99 percent opt for voice. Text messages are sent at a set time, three times a week. The voice messages are sent at a time specified by the women. If for some reason they miss the call, the women can “flash” the system (call and quickly hang up to avoid charges), and MOTECH will immediately call back, ask for the patient ID number, and deliver the message to the client. The pre-written script provides pre-natal information for 42 weeks and the first week of life of the baby. MOTECH is increasing the frequency to include the first year of the life of the baby. (Above: A MOTECH advertisement. Image credit: Grameen Foundation). MOTECH is currently in a pilot phase, and has had to adapt the system to fit the cultural context. As a result, it’s evolved over time, and shared many of the lessons learned recent report. The program is not without its shortcomings. For one thing, the cost of sending SMS and voice messages and distributing handsets to nurses is currently subsidized. Sustainability of the project will depend on finding funding to maintain the system and pay for the communications costs. Still, it certainly will be an mHealth program to watch in the future, as it is potentially a scalable model applicable to rural areas around the world. Josh Weinstein is the author of Develop Economies, a blog about microfinance, international economic development, and issues surrounding poverty alleviation.